Ingredients in conventional insect repellents, namely DEET, have been shown to be very harmful to human health. But we wouldn't want to scrimp on time spent outside because we're afraid of getting bitten by insects. If you live in a humid area, you know this problem all too well. 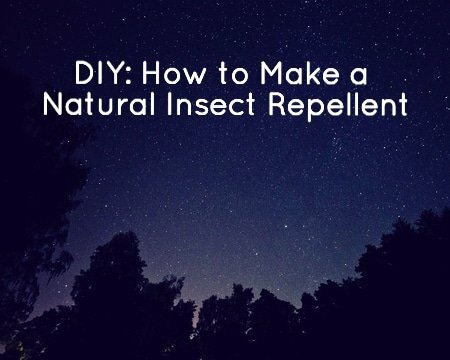 Luckily, you can make your own natural insect repellent using essential oils and a few other ingredients. There are several essential oils that have natural insect repellent properties. If you think about it, plants create these compounds in the first place because they want to repel insect predators. Advice differs as to what ratio of essentials oils or carrier oil, but about 40-50 drops of essential oil per 8 ounces of carrier oil is a good rule of thumb. Water-based insect repellents are light and easy to apply without staining clothing. On top of this, you'll want to add a bit of vodka (if you're not using that as your emulsifier) in order to preserve the formula. What are your favorite essential oils for warding off insects? Let us know in the comments below! Please make it clear for readers if the neem oil you mention is the same they buy for organic use on garden pests. Thanks! I’ve used a mixture of water and lemon eucalyptus essential oil in a spray bottle. I carry with me and spray often, my clothes, arms legs, neck, hair, just not my face. Hi, AMG staff~ Thanks so much for sending these natural preparations. I am just running out of a fresh lemony scented water based insect repellant a friend made and gave to me. So now’s the perfect time to mix my own…with your helpful recipes. I appreciate! You need to include more safety data on several of the above essential oils for ANY skin application & proper detail regarding which species and taken from which plant parts – even in your suggested dilutions. For example All clove oils can cause irritation to skin and mucous membranes. Both clove stem oil & bud oil can cause dermatitis tho bud is the lesser toxic. Use in moderation & very low dilutions – less than 1%. Similar significant issues with cinnamon. Both used as powerful insect repellants but by putting on shelves, surfaces, around base of table legs, to repel ants etc.. There are also minor issues with sage, basil & several contra-indications for some of the thymes. Essential oils are wonderful substances but remember the pharmaceuticals will take any reports of bad reactions to attempt to restrict the sale of pure essential oils. All these lessons were already learned, at least in the UK in the first flush of essential oils popularity in the 70’s, 80’s & 90’s. and there is much safety data in books of that time. Please take great care re safety to ensure the continued access to essential oils for all of us. Hi Lesley! You’re right, we will have an article on the safety of essential oils up very soon! I use lemongrass on my dogs for fleas. It works great and I don’t have fear of what is transfering to their system. I am SO Grateful that you published this! So excited about this website and company. Wonderfully put together.